There is a growing burden of mental illnesses in India; however, the existing mental health professionals can provide for only 29% of the needs, leading to a treatment gap of 70%. One of the solutions to overcome this supply side barrier is the use of information and communication technology such as Tele-Psychiatry to deliver some healthcare tasks via video-conferencing. Our study, IMPACT aims to examine the feasibility and acceptability of the integration of Tele-Psychiatry into primary care services in an attempt to bridge the mental health treatment gap. 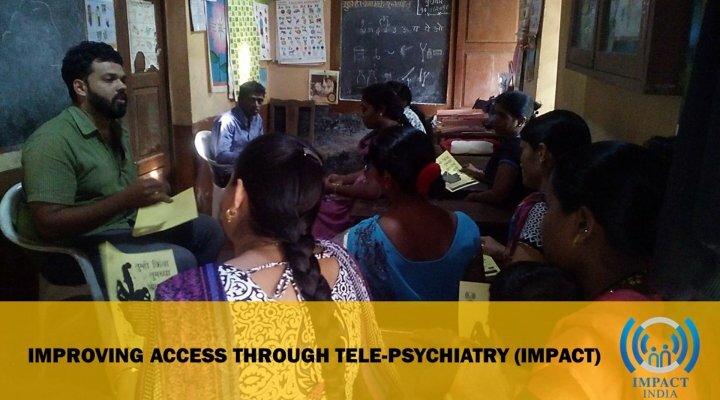 The IMPACT project aims to integrate tele-psychiatry in primary care, and deliver some healthcare tasks via video-conferencing. The project is focusing on building evidence for 1) the feasibility of delivering psychiatric consultation services for mental health problems via Tele-Psychiatry; 2) the acceptability of Tele-Psychiatry services to a range of stakeholders and 3) the impact of psychiatric consultation services via Tele-Psychiatry on clinical outcomes in patients with mental health problems. In this formative research study, a mixed-methods approach will be used, followed by a before-after uncontrolled treatment cohort. Outcomes will be assessed using standardized clinical measures at three-months post recruitment. In-depth interviews will be conducted with patients and their family members, for their experiences and perceived acceptability of the service.